The full party post is TOMORROW! So don’t forget to come check it out. I’m so excited to show it all off! I’ve been planning this party for so long and it went great! But Wednesday is cake day, so I thought it was a great day to show you my cake and HOW I made it! Do you LOVE it? Yes, the Ice cream cone is the cake! 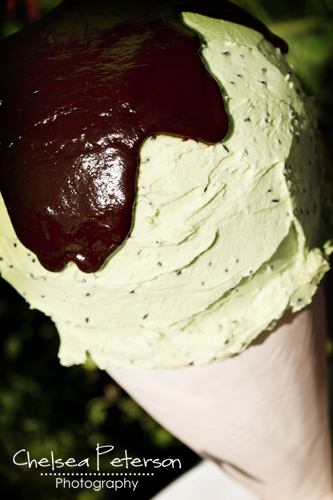 The ice cream is actually the cake with mint buttercream icing, and the cone is Rice Crispy treat with fondant! Want to see how I put it together? You got it! 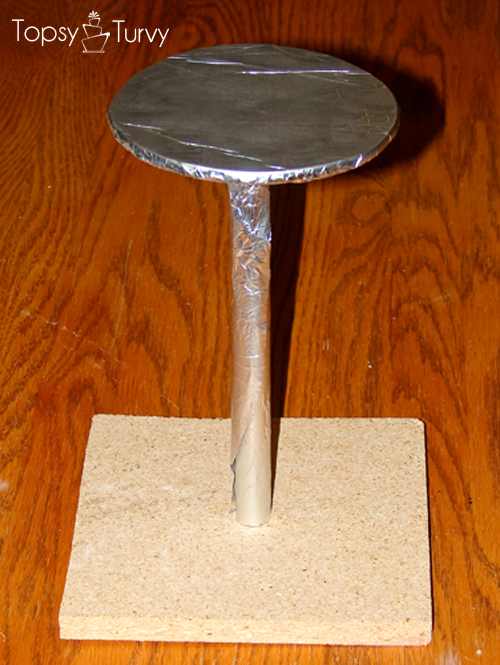 First I had to build a base to hold the cone. I used 3/4 inch thick MDF board for the base, a 6 1/2 inch square. I used a 3/4 inch dowel for the center (not sure how long, ekkk!) 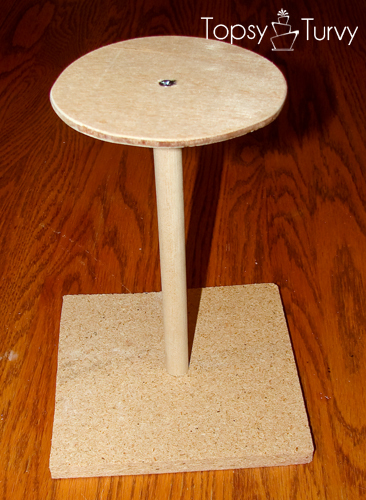 and I cut a 4 1/2 inch circle out of a 1/8 inch thick board for the top. 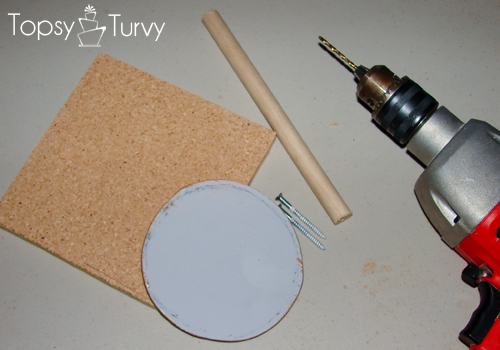 Then I drilled holes in the center of the square and circle as well as the ends of the dowel. Then I used screws to drill it all together! (it looks crooked but it’s just the picture, it’s straight, I promise! Now the fun part! 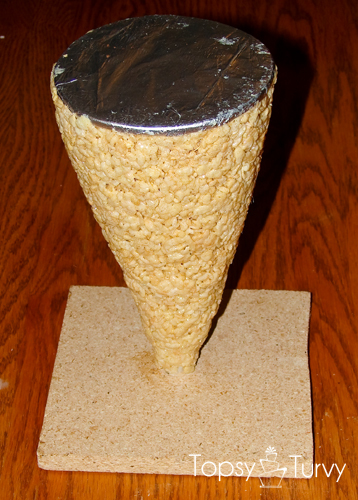 I made a batch of rice crispy treats, then shaped it around the base I made! I used parchment paper to press it into the right shape without getting it all over my hands! Once it’s cool I covered it with ganache that had cooled to spreading consistency. 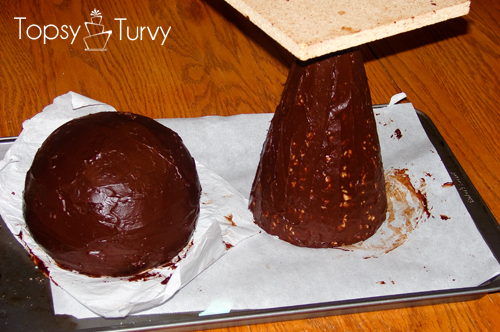 I also covered a round cake (that I cut the bottom off to match the 4 1/2 inch base top). Once it cooled completely and had hardened a bit I used more parchement paper to smooth the rough edges. Here is where I forgot to take a picture! I rolled out some tan fondant into an oval and wrapped it around the cone, then added some slight lines to make it look a bit like the lines in a sugar cone. Then I added the cake on top, frosted it with mint buttercream (mixed with some chocolate sprinkles) and topped it with some warm ganache! Ok Ashlee- this is INCREDIBLE!!! I mean, this is amazing! I love it! Way to go you amazingly talented lady! Thanks Amy! It was so so SO much fun to make! And tasted great too! Thank you so much! It was a really fun cake to design. Esp fun when I do cakes for my family (and self). The whole party was a blast! Hope you enjoy it as well! That is so super cute!!!! I would LOVE a cake like this!! It even looks like it is one of my favorite ice cream flavors. Fabulous job!! Thanks so much! 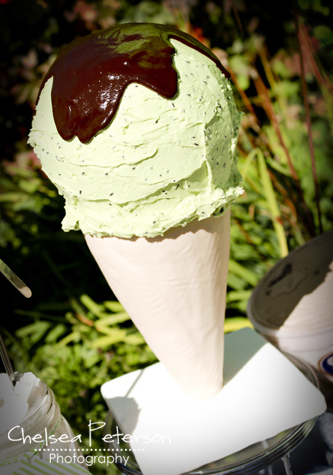 My fav flavor is Mint… My second flavor is chocolate… thus my color scheme for the party! It was a blast to design and create! What a cute idea! Looks great! Thanks! It was fun to come up with, love finding that perfect design for a cake!